This was just a short, quick, one-second clip during episode 7 of Palau. But it never fails to make me laugh. It's also sort of cute. "Redneck" James Miller (he of the "you aint lyin'!" and "come on!" catchphrases) had been voted out of Ulong at the end of episode 6. And it was a great loss to the show, too. 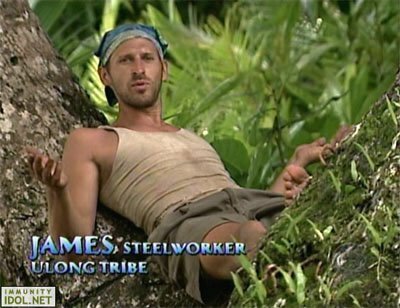 Because I honestly believe that James Miller had the potential to be one of the most interesting Survivor characters of all time. But alas, James left the game in the sixth episode, and that was that. We would never get to hear his distinctive catchphrases again. Because in the very next episode, Ulong and Koror met up for a head-to-head challenge. And this is where Jeff informed the Korors that James had been the latest player to be voted out of the game. 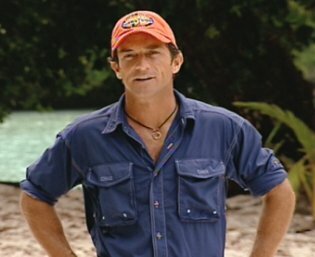 This was standard Probst protocol. 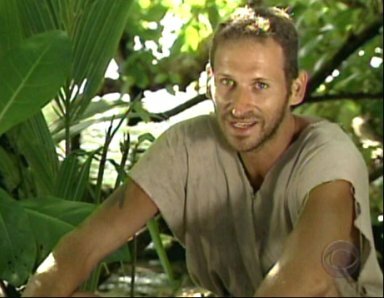 He always told the other tribe who had been the person voted out the night before. 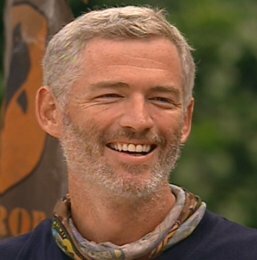 Jeff had been doing this since the very first season. But Jeff was probably not expecting what would happen when Koror heard that their favorite (James) was no longer a player in this game. Because what followed was a quickie (and cute) "tribute" to James from his friends over on Koror. 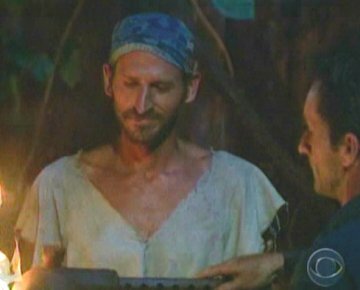 James Miller became the first player in Survivor history to receive an impromptu tribute from players on the other tribe. Check it out. "And here we have the new Ulong tribe. James, voted off at the last Tribal Council." Ulong enters the picture. By law, Stephenie must lead the way. Ian gasps when he sees the missing player. He comments out loud, "James!" Ian follows this with a quickie impression. In a perfect James Miller intonation, he says, "You aint lyin!" Coby follows with a spot-on, perfect "Come on!" It is possible that the Korors were just making fun of James. I don't know. But to me it seemed more like a tribute to a guy who always made them laugh. I think the Korors really missed James when he wasn't around to spout out those distinctive catchphrases. After all, I don't see how you could possibly be around James for two weeks and not get a kick out of the way he talks. So anyway, Koror's off-the-cuff tribute to the fallen James Miller ranks as the #59 moment on The Funny 115. It's not the biggest laugh in the world, and it's probably the shortest moment on the entire list. But I guarantee you can't hear this little tribute without it bringing a smile to your face. Ian and Coby's impressions are absolutely perfect. And even though it's quick, it's awfully cute. "I'll tell you how it's gonna happen. Mario's gonna take my tribute, and he's gonna put it in the top 10. It's my time now. And I know a few things about this list. Aint no way Mario drops my tribute out of the top fifty. Hellllll no."